The people of Mohenjo-Daro were actively engaged in trade with other people of the Indus River Valley and with Mesopotamian civilization. Standardized weights, measures, and scales found in Mohenjo-Daro are evidence that the citizens had an organized system of trade. It is reasonable to assume also that services – construction, artisan, etc – were traded as well as goods. Seals, sculptures, and other artifacts from Mohenjo-Daro (or at least the Indus River Valley Civilization) have been found in Mesopotamia. These discoveries are likely evidence of trade between the two civilizations. Cotton was a commodity the people of Mohenjo-Daro probably exported, perhaps in exchange for minerals, tools, or other goods. 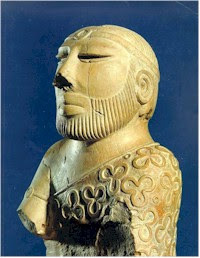 It is probable that the people of Mohenjo-Daro traded with Mesopotamia by sea. 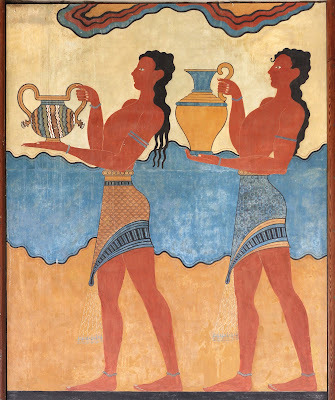 Goods could be moved by riverboat or ox-cart from Mohenjo-Daro south to ports on the Arabian Sea and then by seagoing vessel to the coastal regions of Mesopotamia. Of course goods could also be traded by ground, but given the terrain and geography of the region, trade by sea makes more sense. Many seals made from steatite (soapstone) were found in the ruins of Mohenjo-Daro. The seals often depict animals and have an inscription written in an unknown language. The language on the seals is possibly a form of Dravidian or early Sanskrit, but at this point it is unreadable. The seals and other artifacts found in Mohenjo-Daro point to a polytheistic region in Mohenjo-Daro. Certain plants and animals were sacred to them – the bull, the rhinoceros, trees, etc. This is yet another connection to Hinduism (Brahman, the creator and sacred bull). Cleanliness was also sacred to the citizens of Mohenjo-Daro as indicated by the Great Bath and the sophisticated plumbing and sewage system. It is not clear how the people of Mohenjo-Daro ruled themselves. Masks, like those often worn by kings in ancient times, were found, but the role and extent of the leader’s authority is unclear. The social classes of citizens of Mohenjo-Daro are also unknown. One thing is for sure, a sophisticated system of government was necessary to allow a town with a population of 30,000+ to survive and build the organized infrastructure seen in Mohenjo-Daro.